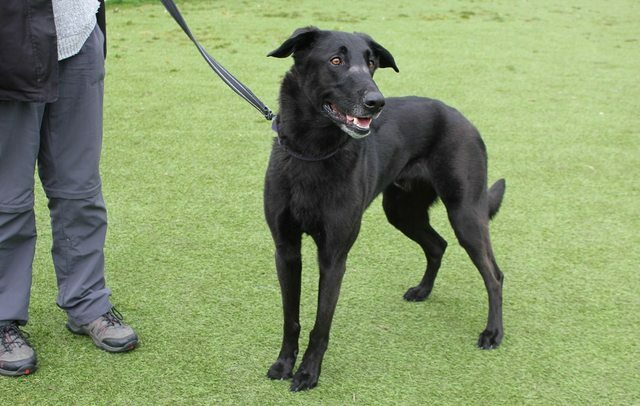 Sooty is a 4 year old male German Shepherd Cross. Stunning Sooty is looking for a new home as his owner feels that she is no longer able to give him the exercise and attention that he needs. Sooty’s owner originally rescued him from Egypt when he was found straying aged around 6 months old, he was quite underweight and had possibly been dumped. He was quite unwell at first and was diagnosed with an under-active thyroid and also had a parasite in his blood, however he is now in good health and his recent blood tests where all clear. Sooty is a large, strong boy! He is primarily German Shepherd but does have some Saluki, Golden Retriever and Labrador in his breeding. Sooty currently lives with a female Rottweiler who he gets along really well with and he also socialises well with other dogs whilst off lead, however he can be reactive towards dogs when he is on the lead, particularly small dogs. 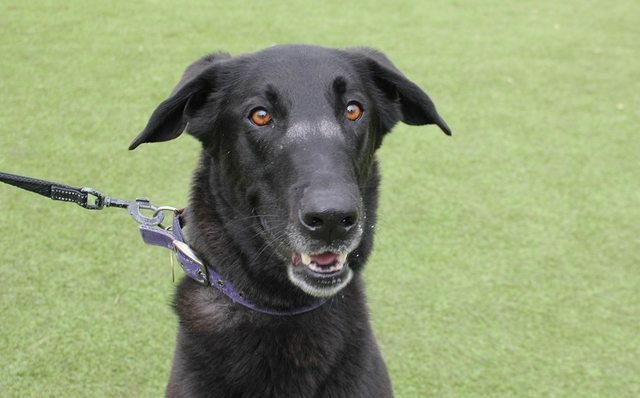 His current owner feels he would be best suited to a home where he can be the only dog as he loves attention. He is not good with cats and has a very strong prey drive. Due to this he cannot be placed in a home with small animals or where he is likely to come into contact with cats. He can be a handful on the lead and will need a confident owner who can control him on walks as he can be reactive towards bikes and joggers. He is also easily distracted by other people whilst off lead and will run over to strangers and try to get them to play fetch with him! Sooty is friendly with new people including visitors to the home. He has no issues being seen by a vet and is happy to be handled. He is a loving, affectionate and loyal boy. Sooty has never been around children so we are looking for an adult only home for him, free from visiting children and without any children planned for the future. This is not because Sooty is aggressive, it is because we need to take into consideration his size and strength. He will benefit from a home with someone around for most of the day but is okay to be left alone for a couple of hours and is quiet and non-destructive. He can jump fences so will need a home with a very secure garden/yard with fencing of at least 6ft. He can become anxious and destructive when in the car so would be best suited to travelling in a cage or wearing a muzzle for shorter journeys. However his owner feels a lot of this behaviour is brought on by the other dog in the home and that Sooty has traveled much better when he has been on his own in the car.